Israel’s cabinet approved a call-up of reservists today, as its military continued attacking Gaza, destroying the main security headquarters after killing more than 280 Palestinians in a first round of strikes yesterday. Israeli tanks were seen deploying in southern Israel, close to the Gaza Strip, raising the prospect that the air raids – which brought the biggest loss of life in a single day in Gaza for more than 40 years – might escalate into a major ground offensive. 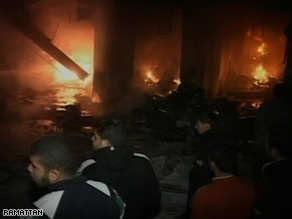 The latest Israeli attack flattened most of the buildings in the security headquarters, the second time the compound had been attacked in two days. At least four Palestinians were killed. Palestinian militants continued to fire rockets into southern Israel, with two missiles reaching as far as Ashdod, an Israeli port about 18 miles north of Gaza. One Israeli was killed in a rocket attack on Saturday. In addition to the 280 dead, at least 600 Palestinians have been injured. Most of the dead appeared to be policemen or security officials affiliated with Hamas, although there were reports of dead civilians. An Israeli air strike yesterday killed seven teenage students at a UN vocational college for Palestinian refugees while they waited for a bus to take them home, said Christopher Gunness, a UN Relief and Works Agency spokesman. At its regular weekly meeting in Jerusalem, the Israeli cabinet approved a reserve call-up, which may indicate a much larger operation is proposed. The Israeli prime minister, Ehud Olmert, reportedly told the meeting that the fighting in Gaza would be “long, painful and difficult”. “Israel will continue until we have a new security environment in the south, when the population there will not longer live in terror and in fear of constant rocket barrages,” said Mark Regev, a spokesman for the prime minister. A UN security council statement called for a halt to the violence, but the US squarely placed the blame for the fighting with Hamas, the Islamist movement that won Palestinian elections three years ago and then seized full control of Gaza last year. A fragile five-month ceasefire between Israel and Palestinian militant groups in Gaza finally collapsed 10 days ago. Israel called up 6,500 reserve soldiers and moved tanks, infantry and armored units to the Gaza border for a possible ground invasion. Some 280 Palestinians died in the first 24 hours of the campaign against Gaza rocket squads. I think anti-Israel rallies are pretty common in Tehran. Fortunately, Ahmadinejad is full of proclamations but not prophesies.